Why Leaders Can’t Lead: The Dunning-Kruger Effect. Warren Bennis in his classic book Why Leaders Can’t Lead: The Unconscious Conspiracy Continues, discussed the forces that e impacted leaders and diminished their ability to lead. One of the major forces was what Bennis called ominous societal trends. This article is an attempt to look at one of those societal trends that I adversely impacts leadership ability. It should be pointed out that is the interaction between multiple societal trends makes leaders impotent. Each trend, taken as a single issue, may not seem that significant. The combination and interplay between them is what is lethal to leadership. Bennis clearly believed that the environment or surroundings that a leader was in impacted their ability to lead. A great leader in one setting may be totally ineffective in a different setting. Many of us have found that true in our own careers. The Dunning-Kruger effect refers to the pervasive tendency of poor performers to overestimate their abilities relative to other competent people. Kruger and Dunning first reported this effect in an extremely influential 1999 article in the Journal of Personality and Social Psychology. The effect involves the tendency for incompetent people not to believe that they are the best in a certain area but rather to believe they are above average. •	Many call this the Lake Wobegone effect where “all the women are strong, all the men are good looking, and all the children are above average. •	Dunning found that people overestimate how charitable they’ll be in future donation drives, but accurately guess their peers’ donations. •	Another study looked at how students balanced “self-interest” against “co-operation” in an artificial test, and then, how they rated themselves. In this study, 84 per cent of the students said they would help or co-operate with their fellow students — but only 61 per cent did. •	“Motorcyclists believe they are less likely to cause an accident than is the typical biker (Rutter, Quine, & Albery, 1998). People think they are less susceptible to the flu than their contemporaries, and as a result avoid getting flu shots (Larwood, 1978). People signing up to bungee jump believe they are more likely to avoid injury than the average bungee jumper, although their friends and family do not share this impression (Middleton, Harris, & Surman, 1996). Surgical trainees place too much confidence in their diagnoses after looking at X-ray evidence (Oksam, Kingma, & Klasen, 2000). After looking over a client’s case materials, clinical psychologists overestimate the chance that their predictions will prove accurate (Oskamp, 1965). •	Business leaders believe their company is more likely to succeed than is the average firm in their industry (Cooper, Woo, & Dunkelberg, 1988; Larwood & Whittaker, 1977). Of course, the Dunning-Krueger effect would also apply to leaders which means average and incompetent leaders would see themselves as above average. Unfortunately, it also applies to consultants and leadership trainers. •	32 percent of the employees of a software company said they performed better than 19 out of 20 of their colleagues. •	4,800 people in a Monster.com survey responded, and 84% of them said, “Yes!”. Monster.com reported the belief that a person they could do a better job than their managers was a widespread phenomenon. Their conclusion? Many employees don’t have respect for their boss. •	Perhaps one of the most significant impacts on business is seen in the longitudinal American Freshman Survey done of college students in America. 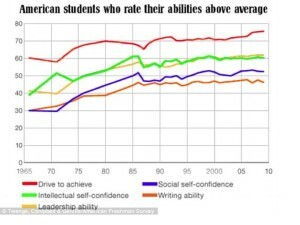 Over the last 40 years of the study, there’s been a dramatic rise in students who view themselves as ‘above average‘ across multiple dimensions, one of which is leadership. 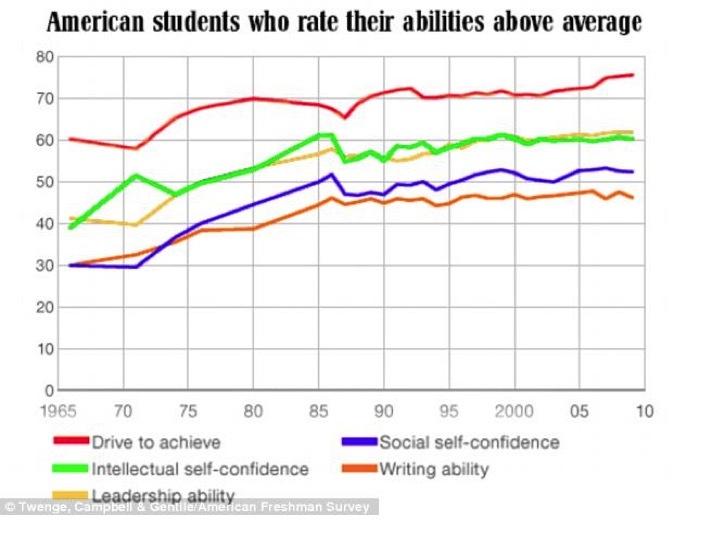 Objective test scores actually show that their writing abilities are far less than those of their 1960s counterparts. Consider the following observations by business leaders about new talent entering the workplace. •	47% of executives believe that only 1/5th of new grads have the skills they’ll need to advance past entry-level jobs. Finally, consider the impact the Dunning-Kruger effect has on the organization culture. Cameron Anderson and colleagues found that overconfident individuals – those who thought their ability to be much higher than it actually was – were given higher status in a group, because they were seen as more competent. This is because overconfident individuals demonstrated the behaviors that we use to judge competence; things like speaking more often, using a confident and factual tone, providing more information and having a calm and relaxed demeanor. Although overconfident individuals didn’t make direct statements about their own ability (“I’m really good at this”), their behavior led others to believe that they were competent, and therefore they were given higher status. Justin Kruger and David Dunning of Cornell University describe the impact in this way. 1	. Incompetent individuals, compared with their more competent peers, will dramatically overestimate their ability and performance relative to objective criteria. 2	. Incompetent individuals will suffer from deficient metacognitive skills, in that they will be less able than their more competent peers to recognize competence when they see it–be it their own or anyone else’s. 3	. Incompetent individuals will be less able than their more competent peers to gain insight into their true level of performance by means of social comparison information. In particular, because of their difficulty recognizing competence in others, incompetent individuals will be unable to use information about the choices and performances of others to form more accurate impressions of their own ability. 4	. 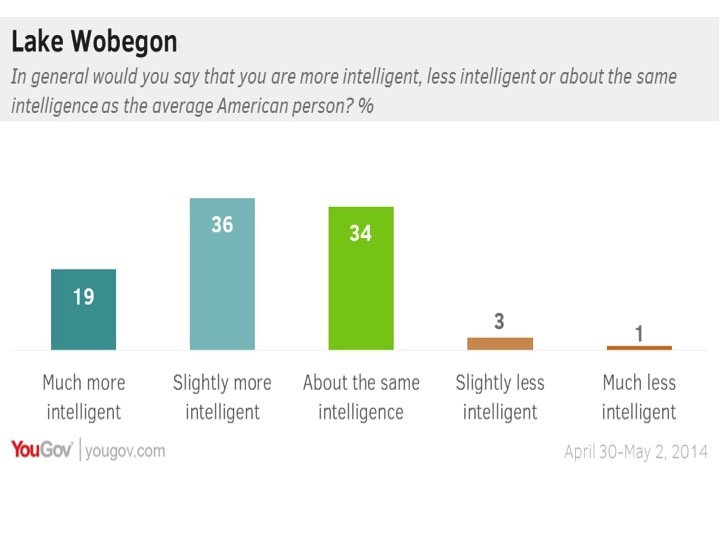 The incompetent can gain insight about their shortcomings, but this comes (paradoxically) by making them more competent, thus providing them the metacognitive skills necessary to be able to realize that they have performed poorly. Great leaders will continue to push for high standards in all these areas. Average and below leaders will avoid the pain and difficulty by avoiding the issue altogether. Perhaps this is why organizations today are doing away with performance appraisal systems. Maybe it is not the feedback that is inaccurate but instead the unwillingness of employees to hear feedback that does not conform to their high view of their own performance. And of course when leaders tell us our work is just average, then we lose trust in them. Lets face it, if most of us are average, then we all have major areas in which we can improve. As Bennis predicted: there is an unconscious conspiracy that exists that inhibits leaders from leading. Employers often hire the best specialists they can find, i.e., the best and the brightest from the best schools. Then the employers promote the best and the brightest (the ever popular high-potentials) based on their job performance doing the work of the employees they will then manage after the promotion. But which ones get promoted into management? The best talker first, the second best talker next, and then the third best talker. The only problem is that the third best talker makes the best manager. Why, because the first and second best talkers talk too much, listen too little, and managers need to listen more than they talk otherwise they never hear what is going right or wrong. The end results is that the best managers never make it into management or if they do they report to senior managers who are not well-suited for management. Then HBR publishes an article bemoaning that specialist cannot function as well as generalists. After CEOs and other executives read the article they’ll then hire the best and the brightest generalists from the best schools, does this sound familiar? Then the employers will promote the best and the brightest generalists based on their job performance doing the work of the employees they will then manage after the promotion. But which ones get promoted into management? The best talker first, the second best talker next, and then the third best talker. The only problem is that the third best talker makes the best manager, reread the paragraph above. The solution to the problem of specialists not being good generalists is to stop hiring the best and the brightest specialists and start hiring specialists who are well suited to be generalists. It is more about who the people are than their degrees. I wonder how this study compares to government leadership–all we have to do is read about the mess with the VA hospital, or how state and city governments are nearly bankrupt. It appears to me that most leaders of this era want to be loved and admired, but have a hard time making the hard decisions. When we teach students that they are all equal we should not be surprised that so many over estimate their abilities.